The examples in this toolkit are drawn from experience of teaching primary music in different contexts and they are adaptable and relevant to teachers in different countries and settings. As such, the toolkit seeks to share ideas and suggestions on how to embed high quality music teaching in your own context, regardless of where that may be. Many of the aspects of the toolkit help teachers to understand what music education is and how it can be promoted. A minority of scenarios relate to a specific context, for example, the National Curriculum in England, yet the ideas, philosophies and practices are equally applicable across other countries, for example The Curriculum for Excellence produced by the Scottish government, Music in the National Curriculum for Wales etc. Whilst the nuances of each curriculum will be related to the context, there are so many transferable aspects of teaching music that we hope teachers would benefit from regardless of where they are in the world and the toolkit seeks to help you explore these flexibly within your own work. Music education encompasses all sorts of learning and situations. Some of this musical learning goes on in the classroom in the form of weekly music lessons and at other times in the school structure, for example singing assemblies, nativity plays, celebrations, choirs, ukulele groups and throughout the extra curricular programme. Additionally, following a pledge from the then Secretary of State for Education, David Blunkett that ‘over time, all primary pupils who want to will be able to learn a musical instrument’ (DfES 2001:12), funding has been available for all children to have access to music tuition on a instrument or singing through a programme of whole-class instrumental or vocal tuition. Funding for this is distributed to Music Education Hubs across England. Find your local MEH lead organisation. 'Music education does have a place as a timetabled classroom subject in the school curriculum, and it should be available to all pupils. It should be seen as part of a general policy for the arts in education, because the arts offer unparalleled opportunities for the development of imagination, sensitivity, inventiveness and delight – essential elements in a balanced curriculum. As the assessment expectations of schools become increasingly onerous, it is inevitable and distressing that in some schools, the arts have become sidelined in favour of exclusive focus on the so-called ‘core’ subjects. This is a very short-sighted view because music has so much to offer that will draw children into learning across the curriculum. This, though, is not the central point here. We learn music for the experiences, skills and knowledge that musical learning itself brings. The bottom line is this…if you do not give all children a musical education in the classroom, you cannot guarantee that they will get a music education at all. If we do not teach music in the classroom, it is not a right for all children. It becomes the preserve of those that can afford it and those whose families actively seek out the opportunities for their children to learn music. It is clear from this document that music is a very practical subject, in which the making and creating of music through using voices, singing, using instruments and technologies is central to a child’s learning experiences. As Paynter’s (1982: xiii) guiding principles note ‘making music is more important than musical information – which is only a support for musical activity’. 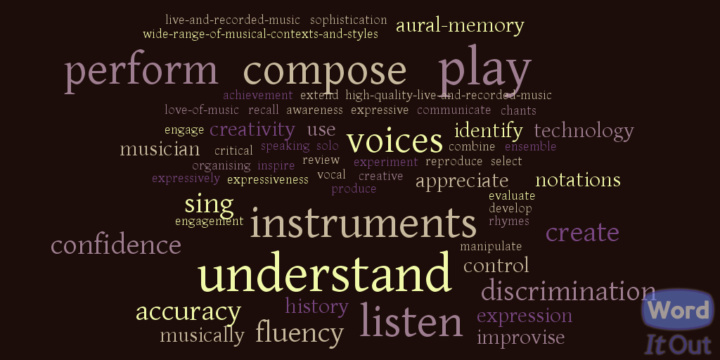 Through active, practical engagement in music, children develop musical understanding and fluency. Notice, too, that the term ‘notation’ is relatively small; we do not need to be able to read or write music to either teach it effectively or learn it. Breaking all of this down, we can see that music education goes beyond a set of skills, knowledge and understanding that we explain to someone else in the sense that, when acting musically, we embody the learning. We do not need to get too deep into unpicking embodied knowledge at this point; the takeaway point here is that the key thing about music is ‘doing it’. After all, think about musicians you know and admire – what you are probably thinking of is vocalists, bands, ensembles, soloists, composers – all making and creating music. This is what we should be striving for in the music education in our classrooms. 1Greater London Authority (2014). Mayor’s Music Pledge. 2Paynter, J. (1982). Music in the secondary school curriculum. Cambridge: Cambridge University Press.